Look what arrived this morning – hot off the press: All That Mullarkey! Beautiful, or what? I took this photo so you could see that the butterflies are silver – including the one on the spine. Isn’t that pretty? I love it. It’s just gorgeous. Revenge and love: it’s a thin line… The writing’s on the wall for Cleo and Gav. The bedroom wall, to be precise. And it says ‘This marriage is over.’ Wounded and furious, Cleo embarks on a night out with the girls, which turns into a glorious one night stand with… Justin, centrefold material and irrepressibly irresponsible. He loves a little wildness in a woman and he’s in the right place at the right time to enjoy Cleo’s. But it s Cleo who has to pick up the pieces of a marriage based on a lie and the lasting repercussions of that night. Torn between laid-back Justin and control freak Gav, she s a free spirit that life is trying to tie down. But the rewards are worth it! All That Mullarkey should be going into the airport shops any day and the High Street soon after. You can preorder it here or here. Things didn’t go quite so perfectly at the weekend. 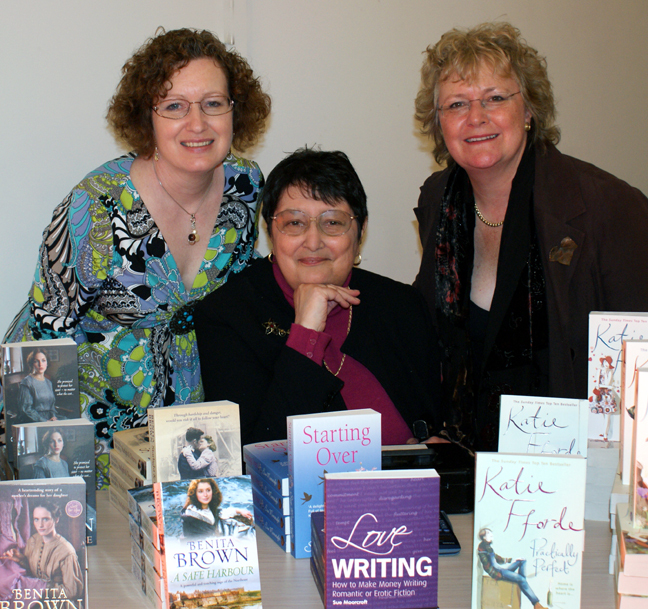 Katie Fforde, Benita Brown and I did a Loves Me, Loves Me Not event at the wonderful Newcastle City Library. But the bookshop forgot to order the copies of Loves Me, Loves Me Not – oops! So, here we are, selling our own books, instead. (sigh) It must be so nice to finally hold the book in your hands. That’ll be me one day, but nobody hold their breath! !